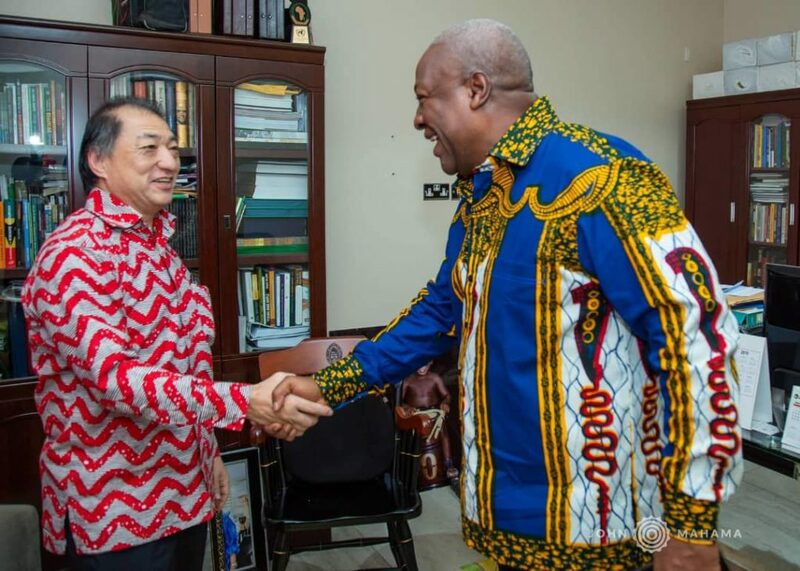 Japanese Ambassador to Ghana, Tsutomu Himeno, on Friday paid a courtesy call on former President John Dramani Mahama at the latter’s residence in Accra. Ambassador Himeno conveyed the warm felicitations of the Prime Minister of Japan, and recounted John Mahama’s long standing and personal relationship with Japan. He also restated his country’s commitment to enhancing its cooperation with the Republic of Ghana and the speedy execution of ongoing projects irrespective of which political party is in government. President Mahama congratulated Japan for its support and recalled the successful restoration of the Yen Loan Portfolio following his personal interventions and meetings with Prime Minister Shinzo Abe. He reminded the ambassador about the Volivo Bridge over the Volta Lake, which was the first project agreed for execution under the Yen Loan Portfolio. Mr. Mahama also thanked Japan for the 1.6 billion Japanese Yen support towards the construction of an Advanced Research Centre into Infectious Diseases at the Noguchi Memorial Institute at Legon. President Mahama pushed for the establishment of the Centre following the Ebola Virus Disease that rocked the West African Sub region in 2014, following which Japan during a state visit to Tokyo by President Mahama in 2016, signed the agreement for the Centre. Mr. Mahama commended Prime Minister Abe and Japan for the stability and economic prosperity being enjoyed by Japan.